[ Thomas Brassey, 1st Earl Brassey, Governor of Victoria. ] 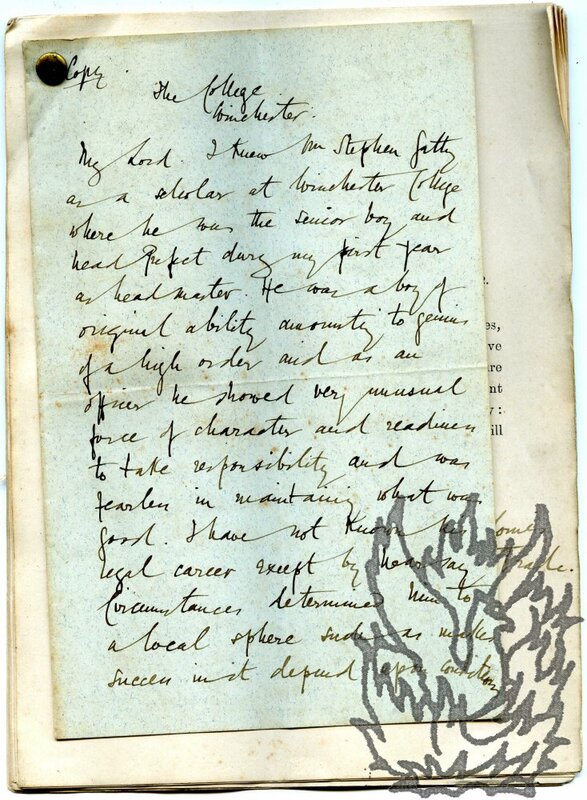 Autograph Letter Signed ('T. 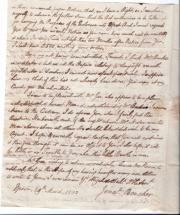 Brassey') to the Secretary of the Royal Naval College Mess Committee, asking to change the date of a meeting, as he is hunting with his brother's hounds. On letterhead of Heythrop, Chipping Norton. 19 February 1876. 2pp., 12mo. In good condition, on lightly-aged paper. 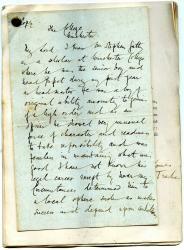 The letter begins: 'I have just come down here, and find my brother's hounds are hunting on Tuesday. I venture therefore to ask, if I may be allowed to change my plans, and to dine with you on Thursday next, instead of Tuesday.' He concludes by explaining why he hopes the change may not be inconvenient. Between 1916 and circa 1966. 'Chu Chin Chow' was a hugely-popular extravaganza based on 'Ali Baba and the Forty Thieves', which, produced and directed by the Australian actor-manager Oscar Asche (1871-1936), premièred in London in 1916, and ran for five years and 2238 performances (more than twice as many as any previous piece), followed by numerous productions and revivals worldwide, as well as two British feature films. The phenomenal success of the piece may be gauged from the fact that it earned Asche alone £200,000. [Printed item.] Proceedings at Suffield, September 16, 1858, on the occasion of the One Hundred and Fiftieth Anniversary of the Decease of the Rev. Benjamin Ruggles, First Pastor of the First Congregational Church. Springfield, Mass. Samuel Bowles and Company, Printers. 1859. 118pp., 8vo. Two engravings, both with tissue guards: frontispiece of the 'First Church erected in Suffield. About 1680. '; and 'The Ruggles Monument'. In cream printed wraps. Errata slip at rear. The item begins: 'A Hundred and fifty years had nearly expired since the decease of the first Pastor of the First Congregational Church, and no monument or stone had been set to indicate to the passer-by his last resting-place. The idea was conceived of erecting a suitable monument to his memory; and on the 24th of May, 1858, the Church appointed Dea. Henry A. Sykes, Daniel W.
[Lawn tennis ephemera from Victorian Banbury.] Eight items [printed by Cheney & Sons], including 'Rules' of the Banbury and West End Lawn Tennis Clubs, and other material from the Hook Norton and Borderers' Lawn Tennis Clubs. Cheney & Sons, Printers, Banbury. Items dated from 1888, 1889, 1891 and 1892. From the archive of Cheney & Sons, 'General, Commercial & Artistic Printers, Banbury'. The calling card of partner John Cheney describes him as a 'Printer in Gold, Silver, and Colours', with 'Specialities in the best class of work', and the company's high standards attracted clients from London's West End. For more about the firm see 'John Cheney and his descendants, printers in Banbury since 1767' (1936), and the Victoria County History volume for the County of Oxford, Banbury Hundred. The eight items are in very good condition, lightly-aged. [Catalogue by Messrs. Birrell & Garnett, Ltd. (J. E. Norton, Graham Pollard).] Early Newspapers. Catalogue 31. 1931. Offered for Sale by Messrs. Birell & Garnett, Ltd. (J. E. Norton, Graham Pollard). No. 30 Gerrard Street London W.1. 24pp., 8vo. Stapled and unbound. On aged and worn paper, with rusting staples. Two indexes in small print on title-page: 'Titles' and 'Places of printing other than London'. 101 items, ranging from the 1645 Mercurius Academicus to the Fleuron, 1923-1930, the last entry ending 'We take this opportunity of expressing our appreciation of the generous review of our TYPE SPECIMEN CATALOGUE [copies of which are still available at 3/6] which occurs on pp. 211-2 of vol. VII.' 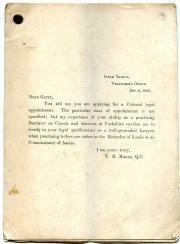 Those interested in the forger Thomas J. 1p., 4to. Worn and aged. 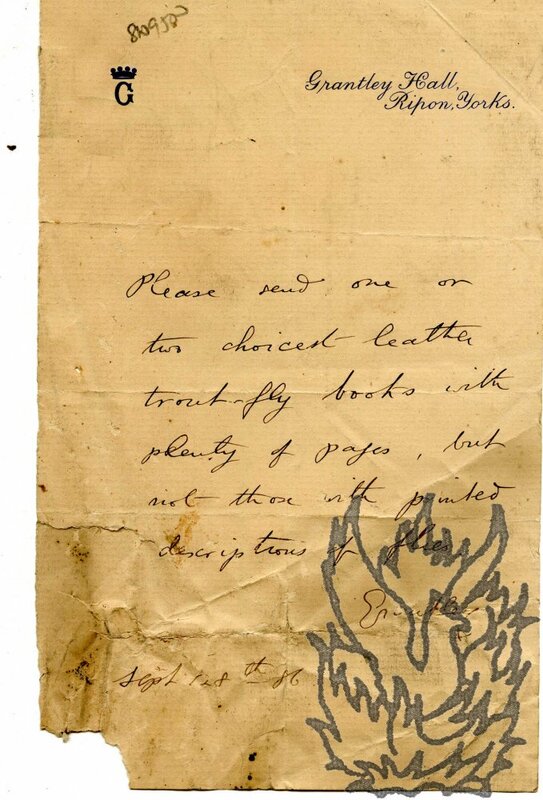 The item has been laid down and cropped to 23 x 19.5cm, with only the top part of Langston's surname is present at the bottom of the leaf. In heavily-inked type. The item reads: 'FREEMEN | OF THE | City of Oxford. | Gentlemen, | I want words to express my acknowledgements to you for your generous conduct towards me this day; and I am proud to find, that the longer the Contest continues the better I stand on the Poll. 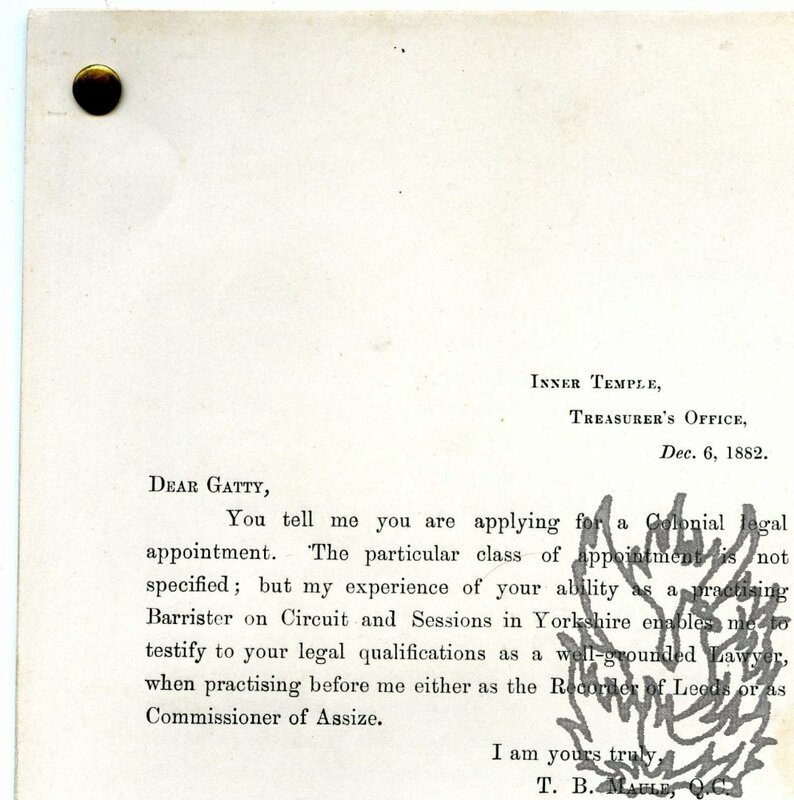 [Printed] Collection of eight printed testimonials, addressed to Gatty by ten leading figures of the British bar, in support of his application to Lord Kimberley for 'a Colonial legal appointment'. All written in December of 1882. 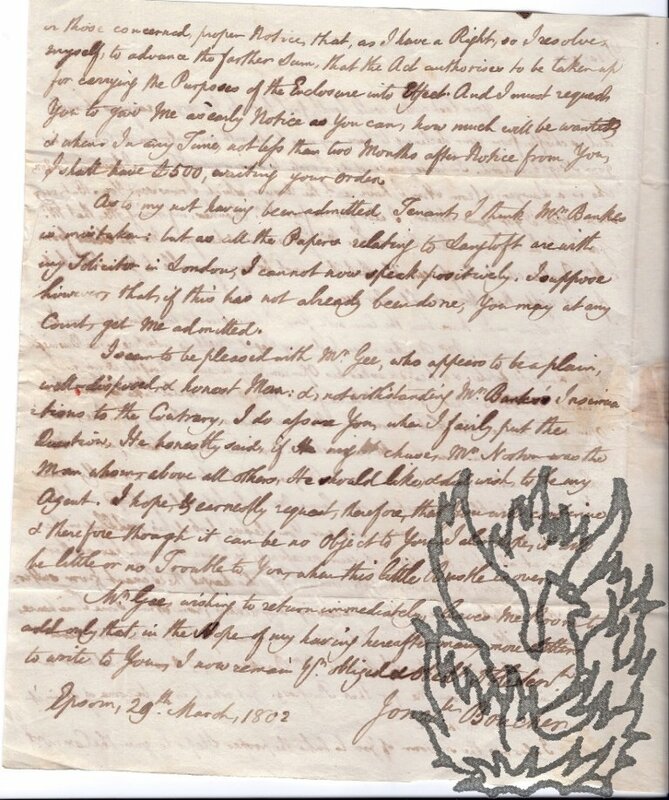 As one of the authors makes clear, the collection was assembled by Gatty himself, for forwarding to Lord Kimberley and others in support of his application. The texts of all eight items clear and complete. On aged and folded paper. They are attached to one another by a brass pin in the top left-hand corner. Each is addressed to Gatty in early December, and all are on one side of a loose leaf of 12mo paper. The writers are as follows: Tindal Atkinson ('Sergeant at Law | Judge of County Courts'); John E. Barker ('Recorder of Leeds'); Thomas Ellison ('Judge of County Courts'); Sir J. B. 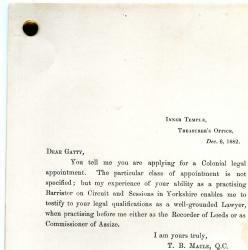 Collection of ten printed testimonials, addressed to Gatty by ten leading figures of the British bar, in support of his application to Lord Kimberley for 'a Colonial legal appointment'. As one of the authors makes clear, the collection was assembled by Gatty himself, for forwarding to Lord Kimberley and others in support of his application. The ten items are in very good condition, on lightly-aged paper. They are attached to one another by a brass pin in the top left-hand corner. Each is addressed to Gatty in early December, and all are on one side of a loose leaf of 12mo paper. The writers are as follows: Tindal Atkinson ('Sergeant at Law | Judge of County Courts'); John E. Barker ('Recorder of Leeds'); J. H. de Ricci; Thomas Ellison ('Judge of County Courts'); Sir J. B. 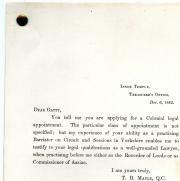 Collection of ten testimonials (nine printed and one in his hand) supporting Gatty's application to Lord Kimberley for 'a Colonial legal appointment'. 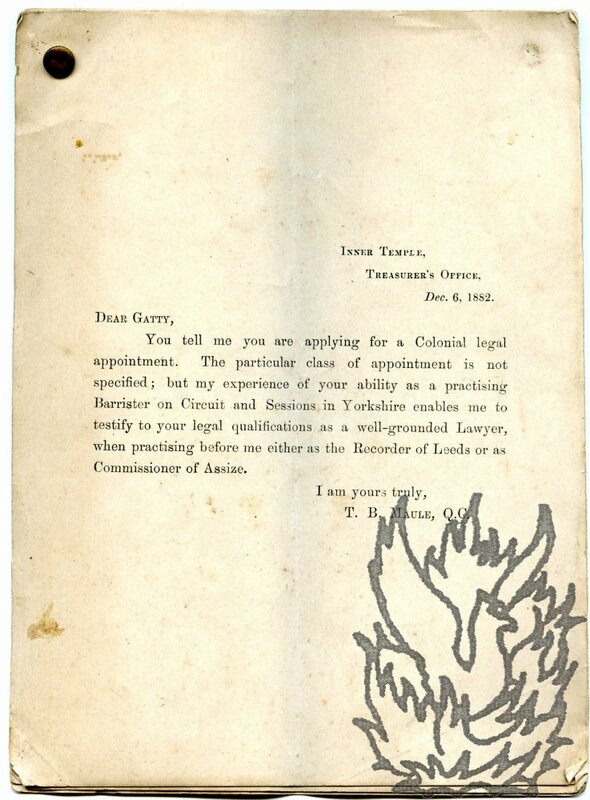 As one of the authors makes clear, the collection was assembled by Gatty himself, for forwarding to Lord Kimberley and others in support of his application. It is on aged paper, with all texts clear and complete, except for two small central holes (affecting two words) in one of the printed testimonials (Wake). The ten items are attached to one another by a brass pin in the top left-hand corner. Manuscript and Printed Marriage Certificate on parchment, signed by thirty individuals. Dimensions roughly nineteen inches by thirteen inches. Aged and a tad grubby, but in very good condition overall. Small piece, roughly one inch square, cut away from bottom left hand corner. Government five shilling stamp in top left-hand corner. Autograph Note Signed ('S. 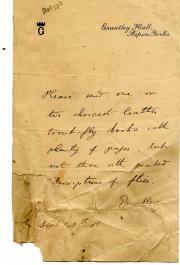 R. Lushington') to unnamed Post Office official, and with official directions on reverse. 21 August 1836; Norton Court, Feversham [Faversham], Kent. Three Typed Letters Signed and one Autograph Letter Signed to Anne Marreco. 1947, 1948 and 1963; London. Upper middle-class English writer (1916-74), editor of the 'Spectator' magazine 1947-9, biographer of Queen Mary, beaten to death by gay lover. The recipient (1912-82) was a writer under the pseudonym Alice Acland. Born Anne Acland-Troyte. Her first husband was Robert Egerton Grosvenor, 5th Baron Ebury, and her fourth Anthony Freire Marreco, the last survivor of the seven-strong British prosecuting team at Nuremberg, with whom she lived in Ireland. A series of camp, gossippy and revealing letters to a close friend.